How would you feel if one day someone took away your favorite beverage and replaced it with something they said was good for you? Would you squeal in frustration? Would you refuse to work? Would you sulk? If you said, “yes” to any of these questions, you agree with most weaning pigs: Change can be hard. The weaning period can be challenging for pigs and pork producers alike. The transition from sow’s milk to dry feed can cause stress which in turn can lead to performance setbacks and a less than optimal return on investment. 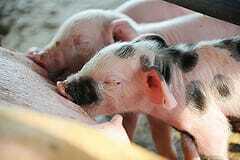 Pigs that become early eaters have a better chance to continue to grow quickly. According to research from the Purina Animal Nutrition Center, pigs weighing between 18 and 21 pounds at weaning reached market weight 17 days sooner than those with weaning weights between 9 and 12 pounds. On average, they also finished 3.2 pounds heavier. To achieve a successful transition, think of weaning in three steps. Introducing dry feed while pigs are still in the farrowing facility can help pigs become accustomed to the new feed and prevent changes from happening all at once. Brown recommends the first dry feed be placed in the farrowing crates three to five days before weaning at a rate of 1.5 to 2.5 pounds of feed per litter. Choosing a creep feed that contains complex, highly digestible ingredients and is formulated to taste and smell like sow’s milk helps create eaters by encouraging pigs to eat. Also, using a starter feed in the nursery with a similar taste and smell as the creep feed will help them transition quicker and take those first bites faster after weaning, getting them off to a good start. Continue feeding a similar, palatable starter feed through the weaning transition. Make sure the newly introduced feed is consistent between the pre-weaning and wean-to-finish sites. This consistency can help minimize variation at a time when many factors are changing. Place fresh feed on mats as soon as pigs arrive at the new facility. Focus on a group routine to foster eating throughout the day. Pigs are more apt to eat in groups, which makes mat feeding an advantage during the post-weaning stage. The transition period can be stressful, but many tools are available to minimize the negative impacts of weaning stress. Successful strategies include introducing dry feed pre-weaning, offering feed with similar ingredients between phases and using mats to provide small amounts of feed regularly. Minimizing stress at weaning supports performance through every phase at finishing.